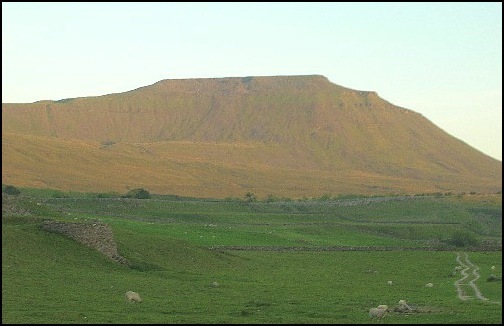 Ingleborough and Park Hill from the Hill Public House on the Lower Sleights Road. Well it has taken just under three years for Anne and me to complete the famous Dales Three Peaks of Pen-y-ghent (2276 ft), Whernside (2414 ft) and Ingleborough (2372 ft). Ingleborough, our last peak, is quite a massive mound in area and there are a number of ways up it. From the east and south it is a long slog up from Horton in Ribblesdale or Clapham respectively. From the south west it’s a lesser slog from Ingleton. Our route was the short steep route from Chapel Le Dale in the west, which is also the way taken by those fit individuals that do all three of the Three Peaks in a day. Having parked in a lay-by just north of the Hill Public House on the Lower Sleights Road – the Ingleton to Hawes Road - we admired the view of Ingleborough before setting off on the very well signposted path. 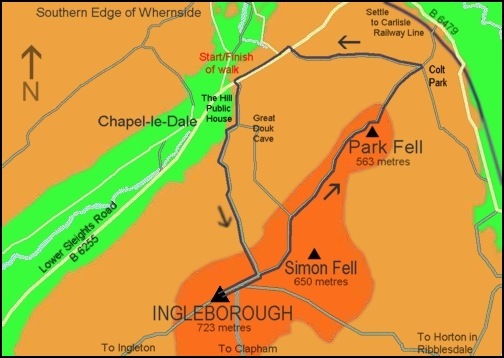 Map of our route up and down Ingleborough and Park Fell. 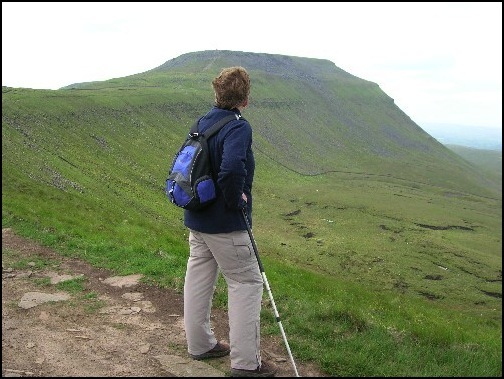 Initially it was very easy going; Ingleborough saves its really steep bits to the end. Ahead of us were a group of youngsters going on a caving expedition – rather them than me – but after about half a mile or so they vanished to the left to descend into the depths of a cave called the Great Douk. This photograph was take a couple of days before we did this walk. 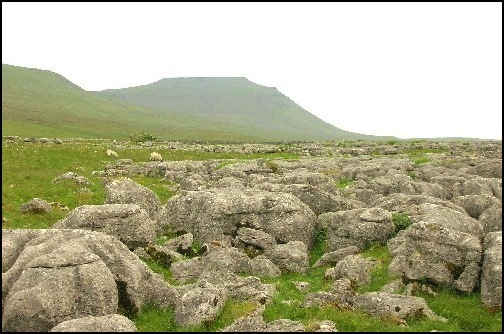 At this point the sheep grazing areas at the lower levels became rockier; light grey limestone outcrops/pavements that this area is noted for became more evident. Soon after the track bent to the left around one of these outcrops and having negotiated a way through a group of cows we noticed on the left what I presumed to be a massive shake hole, or was it a doline? 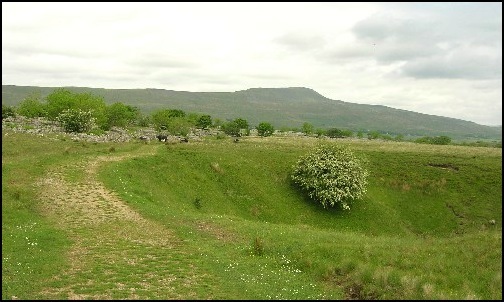 The Shake Hole with Whernside, the highest of the Three Peaks, in the distance. A few minutes later our track became a boardwalk to safely allow us to cross a very damp area. 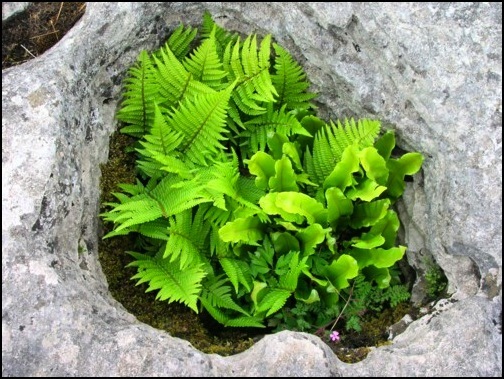 It was very evident that a great deal of time and effort had been spent constructing and maintaining the path and certainly without this assistance the route would have been extremely damp underfoot. Needless to say there was a good selection of plants that thrived on these damp conditions and Anne was enjoying stopping to admire them, and all the time in front of us was the steep sided plateau topped Ingleborough and a really stiff climb ahead. to the centre of the picture and Whernside in the distance. However, before this steep ascent the climb was quite easy, thanks to more labours by construction/maintenance groups who had laid large limestone slabs to prevent the path being eroded by walkers. It certainly made the steady climb a lot easier than I had expected. Soon the path became stepped and things got a little harder, and then the base of the climb onto the ridge to the left (north-east) of Ingleborough was reached. Here the path became a rocky stairway and the going became more difficult, but was easier than it looked from a distance and in about 15 minutes the top of this stairway and the ridge was reached. The climb onto the ridge to the north-east of Ingleborough. A short stop was then made to admire the views, particularly those towards Whernside. The visibility was not as good as I would have liked, the sun had not burnt off the morning mist, but it was still good. Turning right we followed a broken path upwards. Initially it was straight up but as it neared the top it veered to the right to bypass a steeper section, and then we were on the top. It had taken slightly under 1¾ hours, but we certainly hadn’t rushed the ascent. It was now lunch time so we took advantage of the rocky windbreak near the Ingleborough Trig point to enjoy sausage sandwiches and a drink. Thanks to David for the sausages. 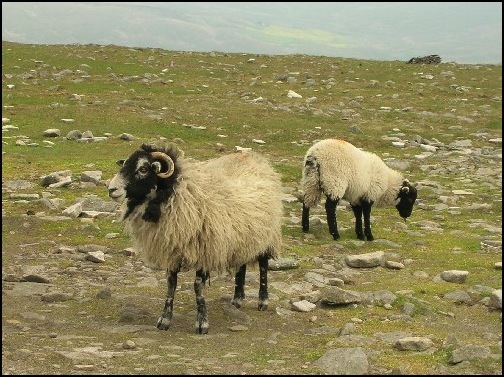 A couple of sheep on top of Ingleborough. Earlier they had attempted to deprive us of our sausage sandwiches. We then had a little wander around the plateau to have a look at other routes to the top, including the track from Ingleton, before starting our descent. But which way should we go? 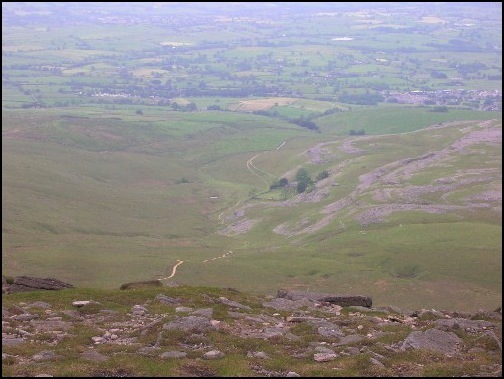 A view from the top of Ingleborough - the route to Ingleton. 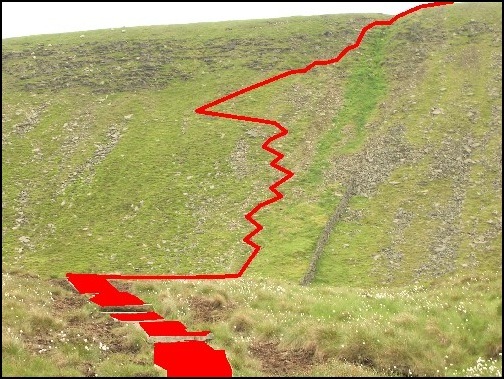 Anne had found the “staircase” quite difficult and, as we had both realised the descent would be even more awkward, we decided to walk along the ridge northwards towards Park Fell and look for an easier exit route. We initially considered coming off the ridge to the north west of Simon Fell, but this looked as difficult as the way up, so we decided to follow the ridge path, northwards all the way to Park Fell. This was probably the best part of the days walking. 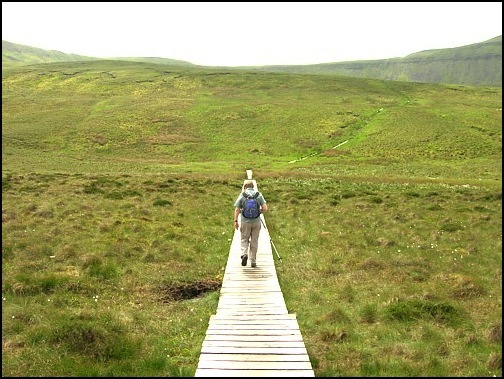 This high level path gave wonderful views of the limestone pavements between us and the Lower Sleights Road and Whernside beyond. We were even able to view trains going over the famous Ribblehead Viaduct located at the base of Whernside. 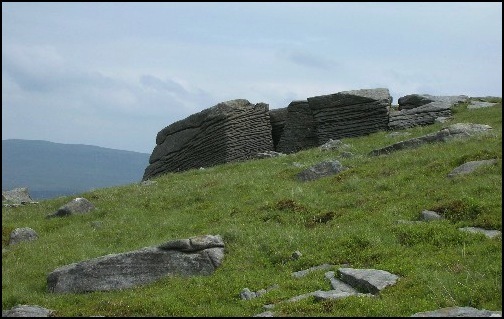 Rocks seen on the route between Ingleborough and Park Fell. Park Fell was reached, however because of a dry stone wall on our right we were not able to reach the summit trig point, but we were able to see, to the south east, the impressive shape of Pen-y-ghent. The top of Park Fell.This was the end of our ridge walk. Now it was downhill. A tricky descent for aging knees, towards a group of farm buildings at a place called Colt Park located between Park Fell and the Settle to Carlisle Railway Line. However, before reaching the buildings we took a sharp left turn, almost back on ourselves, and followed a level path across pastures, meadowland and outcrops of limestone pavements until we reached the Low Sleights Road about half a mile north east of where we had left the car earlier that day. 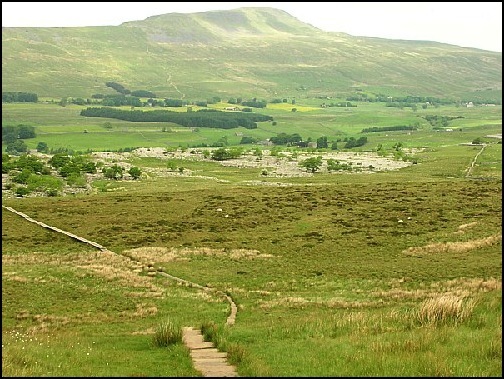 Left to right Park Fell, Simon Fell and Ingleborough. The total distance walked had been a little over 7 miles. It had been very enjoyable and I would not say no to doing this excursion again, although I’m not sure if Anne would be so keen. Yet again she had informed me it would be the last time I got her up a mountain. We shall see.!! seen on the way to the Lower Sleights Road. The map used was the OS Explorer OL2 Yorkshire Dales- Southern and Western Areas, although if you are going straight up and down from Chaple-le-Dale a map is not really necessary.